Looking at the adorable Boston terrier and French bulldog, you might have a hard time to distinguish which is which. Both puppies are extremely cute, adorable, and have furry features. And let’s be honest, they share a lot of similarities. However, there are also differences between the two breeds. 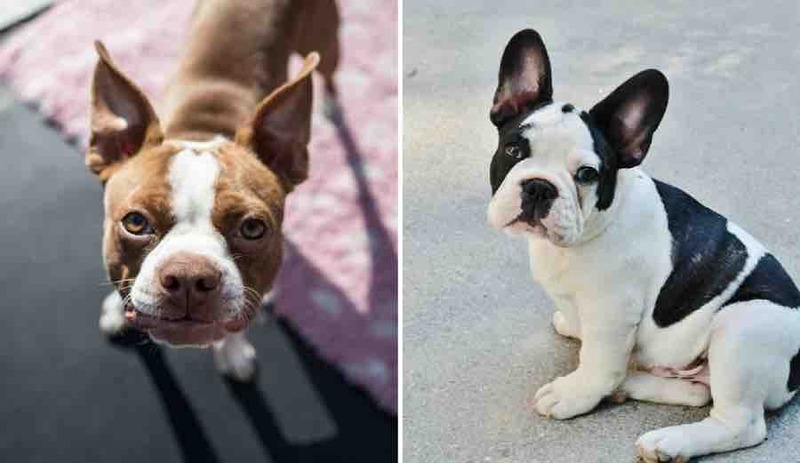 Today, we will discuss the differences and similarities between these two, and find which dog is better for you in the Boston terrier vs French bulldog dilemma. Whenever you are buying a puppy, you want to know the history of the breed. The history of the puppy will help you understand his temperament, character, instincts, and so on. The Boston terrier got his name thanks to the city of Boston in Massachusetts. In the early 1870s, breeders crossed English Bulldog with an English White Terrier, and they got a breed called Hooper’s Judge. From there on, they crossbred with English Bull Terrier, Boxer, Pit Bull Terrier, and even French Bulldog. The result is what you have now as the Boston terrier, who was the first non-sporting breed in the United States of America. The French Bulldog, on the other hand, has fewer ancestors. But both breeds share a common ancestry, which is the English Bulldog. For those of you that do not know, the English bulldog was actually a popular ratter back in the days. When these English puppies came to France thanks to the Industrial Revolution, they were crossbred with French terriers, and we got the French bulldog. Parisian women loved the breed, and fall in love with their bat-like ears. These two breeds share very similar features when it comes to appearance. Cuteness aside, both of these breeds have short snouts, bug-eyes, and minimal tails. However, there are also some differences. The easiest way to make a difference between the two is to look at the ears, and their build. For starters, the size of the two breeds is very different. While both are considered small dog breeds, Frenchies have a muscular build and a larger bone structure. They can reach a weight between 17 and 33 pounds, while Boston terriers go between 14 and 28 pounds. The Boston terrier has a leaner body, with longer legs. That is why the Boston reaches a height between 14 and 16 inches, while the Frenchie is at most, 13 inches tall. As mentioned previously, the main difference in appearance is the ears. French bulldogs are known for their distinctive bat-like ears, which are moderate in size and stand erect on their square-shaped head. On the other side, the Boston terrier has pointed ears and their head is round. As for the tails, both breeds have stumpy, and little tails that can be straight or screwed. Malformation in the vertebrae causes the screwed tail, and it is more common in French bulldogs. Some people call the Boston terrier “a true Gentleman”. The reason? Their tuxedo-style markings in brindle, seal, or black with white. The Frenchie, on the other hand, comes in more color. One thing you have to remember when you talk about activity levels and energy, the Boston terrier is a terrier by nature. Terriers are some of the most active breeds. With that in mind, both breeds require a moderate amount of exercise to be healthy. However, the Boston tends to be a little more active and apter than Frenchies to experience impressive bursts of energy from time to time. Those are called zoomies, and you will love when your Boston gets them. Another thing to consider, the Boston terrier can also go on runs with humans, meaning you can take him on your 5k. However, if it is hot out, or the run is an extensive one, even the Boston terrier can easily overheat. Remember, these breeds have breathing issues, but more on that later. In terms of movement style, the Boston terrier is more sure-footed with a balanced rhythmic gait. Both these breeds are considered small dog breed, but what they lack in size, make up in personality. So, when you talk about Boston terrier vs French bulldog personality, which one wins. The Boston terrier is called the American Gentleman, remember, and they live up to that name. Your terrier will be lively, alert, and intelligent. He might go from a burst of energy in one moment to cuddling in the next one. The Frenchie, on the other hand, is nicknamed the Clown in a Clock. It is their cheeky personality and friendly disposition that makes them ideal family pets. If the Frenchie cannot make you laugh, a few things will do. The French bulldog is quite affectionate and loves to cuddle. With that in mind, both dogs are super loving breeds and can make amazing family pets. Word of notice: the Frenchie can be protective around small children, so you have to socialize him properly with humans and other animals at young age. Neither of these breeds barks on a regular basis. They do only if they have to communicate with you urgently. Being a terrier, the Boston can bark a little bit more. Both Boston Terrier vs French bulldog bark as an alert when intruders are coming. The main difference is the French bulldog is a bit more protective of his family. One of the biggest Boston terrier vs French bulldog dilemma is training. Which breed is more trainable? Which one will listen to and react to commands better? If you are a first-time owner, you are better off with a Boston terrier. They are a bit more intelligent, but on the flip side, can be territorial. When it comes to French bulldogs, you have to be more authoritative in the early days. Positive reinforcement is the best way to train your puppy. The Frenchie can be little on the stubborn side and will require more consistent training to get the results you want. Bully breeds, including bulldogs, are known for their stubbornness. Both of these breeds can easily adapt to living in an apartment. They can control their energy indoors. But the Boston will require a little bit more exercise once you are outside. The Frenchie, on the other hand, can live with just little amount of exercise and will happily sleep around the house in the meantime. One downside, neither of the breeds can live in exceptionally hot or cold weather. Because of their shortened muzzles, both of these breeds overheat more quickly. We mentioned previously that breathing problems can follow both of these breeds. That is because they have short muzzles and have trouble breathing. Because of their build, they can also overheat more quickly. Boston terriers can also develop eye problems and injuries, as well as patellar luxation. The French bulldog, on the other hand, is prone to bone and joint problems, as well as spinal malformations and back defects. As you can see, it is hard to answer the Boston terrier vs French bulldog dilemma. Both of these breeds share common features like short snouts, docked and minimal tails, adorable smile, short coat, and upright ears. The difference might be whether you want a more active dog, or one that is more prone to cuddling and sleeping at home. Of course, you have to put the price into perspective as well. French bulldog from a good and reputable breeder can cost three times more than the same quality Boston terrier.